i usually try to keep business + play separate, but i've decided i can't keep this great sale a secret. the passionate collector has been one of my graphic design clients for many years now. her bling is some of the best i've seen. 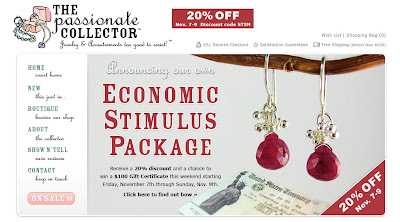 a fabulous 20% off sale is going on this weekend only. don't miss out on this early holiday shopportunity. her jewelry collection is unique and special. am thinking i have to get these classic pretty pearls for all my girlies this christmas, they are gorgeous and only $15.00. and while you're browsing the shop be sure to sign up on the mailing list for a chance to win a $100 gift card. happy weekend. get out there (or stay in) and get a head start on your christmas list. just received my mini diary, so cute. thanks again!